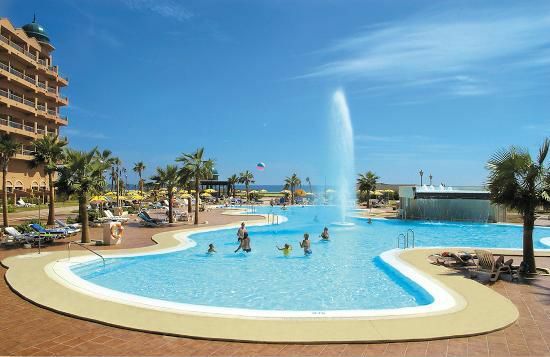 Top 4* Hotel with 320+ Rooms front Beach on the Costa double rooms equipped with direct line telephone, hairdryer, bathroom, satellite television/cable, central heating, central air conditioning, etc. in S Spain. This magnificent hotel is located in the sea-side promenade Costa -SPAIN). The extraordinary location of this HOTEL, in front of the beach with magnificent views to the Mediterranean and, quiet, not far from the center town and the shopping area. It is perfect for those who wish to visit this area and enjoy the beautiful beach. This luxurious hotel consists of several outdoor swimming pools surrounded by large gardens, including one for children, as well as a games room, a gym for the most sportsmen and a leisure club. Almeria airport is just over half an hour away. The HOTEL also offers its clients currency exchange, games area, parking, elevator, loungers, kiosk where you can buy the daily press, lobby with reception, laundry service, heating, safe, ping pong, billiards, games room, etc.. The hotel completes its facilities with a bar, a restaurant, reception open 24 hours a day, shops in the hotel, indoor swimming pool, outdoor swimming pool, parking etc..
Internet connection is available throughout the hotel free of charge. The garage is private with charge in the hotel and with the need of reserving it previously. Among other things, the hotel allows the check-in of its clients after midday, and checkout just before this same hour. Pets are not allowed except in the case of guide dogs accompanying blind people. Among the forms of payment the hotel offers its customers the possibility of using the following cards: Maestro, Visa and Euro/Mastercard. Besides this, you can also find: Shopping Mall 555 m, Theatre at 1260m, Aquarium at 1262m, Great Classical Hall at 2.412m.